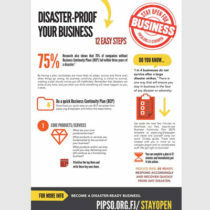 Find out how you can reduce risk, be ready, respond accordingly and recover quickly from any disaster as a business through the Disaster-Ready Business Toolkit available on this page. Watch the videos below and read the fact sheets listed under Resources. We encourage you to share these videos and fact sheets with your friends, colleagues, associates and networks as much as possible so we can all help each other to become disaster-ready. If you are a private sector organisation, chamber of commerce, business council and/or a disaster management office from the region, you can maximise and customise this toolkit to suit your country-specific needs. We have a manual which you can download that includes some basic instructions on how best to use the toolkit as well as a Facebook content plan, radio messages and text messages that you can translate and/or use immediately as part of an awareness campaign in your country. 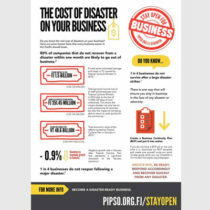 Do you know that 1 in 4 businesses don’t survive after a large disaster strikes? 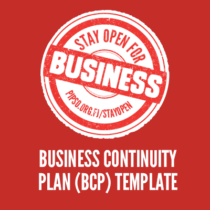 Use our quick 12-step guide so you can create a BCP for your business using the template above. View fact sheets and other downloadables. This toolkit would not have been possible without the combined resources and expertise of people from different organisations. 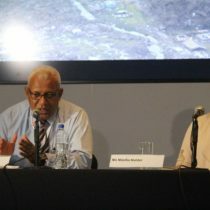 It is brought to you by The Building Safety and Resilience in the Pacific Project (BSRP), implemented by the Pacific Community’s Geoscience Division (GSD), in collaboration with the Pacific Islands Private Sector Organisation (PIPSO) and the Fiji Business Disaster Resilience Council (FBDRC). Thank you to our content and funding partners: The European Union (EU), African, Caribbean and Pacific Group of States (ACP) and United Nations International Strategy for Disaster Reduction (UNISDR). A special thank you to the Wellington Region Emergency Management Office (WREMO) who was generous with their content assistance. the numerous business-owners and entrepreneurs from around the Pacific who participated in our toolkit testing to give valuable feedback, and to The Greenhouse Studio who created and designed the materials for this toolkit. All rights for commercial/for profit reproduction or translation, in any form, reserved. SPC authorises the partial reproduction or translation of this material for scientific, educational or research purposes, provided that SPC and the source document are properly acknowledged. Permission to reproduce the document and/or translate in whole, in any form, whether for commercial/for profit or non-profit purposes, must be requested in writing. Original SPC artwork may not be altered or separately published without permission.